David Clarkson's late winner moved Bristol Rovers close to League Two safety to leave Wycombe Wanderers slipping into the relegation zone. Lee Brown curled in a free-kick to put Rovers in front before Matt McClure's superb back-flicked volley made it 1-1. McClure put a good chance wide and then was at fault at the other end, guiding a cross into the path of Clarkson, who finished from close range. Northampton's win over Dagenham means Wycombe are three points from safety. They will have to win at bottom side Torquay, who were relegated on Saturday, and hope that either Rovers or the Cobblers lose on the final day of the season. Darrell Clarke's Pirates will need just a point at home to Mansfield to preserve their Football League status, while Northampton host Oxford. "Everything's gone against us today. It's a bad situation. It's a really down atmosphere. But I've got to pick them up, I've got to turn this around and get a result at Torquay next week." "I didn't think there were many chances. We had the majority, but as has been the case this season we struggled to stick the ball in the back of the net. We were on top. We were in control of the game. "They only had one chance in the second half, I was happy with the way we were playing, just a little bit more quality around the box would have been better." "We know there's still work to be done. Obviously we are delighted to have won this football game but we have still got a job to do at home. "It's great to get three points and it stays in our hands until our final home game but nothing is done yet. I don't want people to be carried away to think it is. "I know that we'll have a full Memorial Ground on Saturday but there is still plenty of work to do." Match ends, Wycombe Wanderers 1, Bristol Rovers 2. Second Half ends, Wycombe Wanderers 1, Bristol Rovers 2. Kaid Mohamed (Bristol Rovers) wins a free kick in the defensive half. Foul by Steven Gillespie (Bristol Rovers). Corner, Wycombe Wanderers. Conceded by Mark McChrystal. Substitution, Bristol Rovers. Ollie Clarke replaces John-Joe O'Toole. Reece Styche (Wycombe Wanderers) wins a free kick in the defensive half. Attempt saved. Kaid Mohamed (Bristol Rovers) left footed shot from long range on the left is saved in the bottom right corner. Substitution, Wycombe Wanderers. Reece Styche replaces Steven Craig. Substitution, Wycombe Wanderers. Junior Morias replaces Max Kretzschmar. Corner, Bristol Rovers. Conceded by Aaron Pierre. Foul by Chris Beardsley (Bristol Rovers). Goal! Wycombe Wanderers 1, Bristol Rovers 2. David Clarkson (Bristol Rovers) right footed shot from very close range to the bottom right corner. Seanan Clucas (Bristol Rovers) is shown the yellow card. Substitution, Bristol Rovers. Chris Beardsley replaces Matt Harrold. Steven Craig (Wycombe Wanderers) wins a free kick on the left wing. Attempt missed. Matt McClure (Wycombe Wanderers) right footed shot from the centre of the box is close, but misses to the right. Substitution, Bristol Rovers. 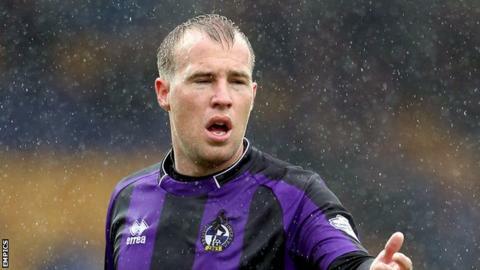 Steven Gillespie replaces Fabian Broghammer. Corner, Wycombe Wanderers. Conceded by John-Joe O'Toole. Second Half begins Wycombe Wanderers 1, Bristol Rovers 1. First Half ends, Wycombe Wanderers 1, Bristol Rovers 1. Attempt missed. Anthony Stewart (Wycombe Wanderers) right footed shot from outside the box is close, but misses to the right. Attempt blocked. Matt McClure (Wycombe Wanderers) right footed shot from outside the box is blocked.